Home » Battle of the Coffee Pod Machines: Who Comes Out on Top? Battle of the Coffee Pod Machines: Who Comes Out on Top? Let the battle of the coffee pod machines commence. For this battle, we have two worthy contenders: The DeLonghi Nescafe Dolce Gusto vs. The Tassimo T20. Let’s begin! How do you make the perfect cup of coffee? Sure, the coffee beans, the milk, and the sweetener are all important components, but it all starts with the coffee maker. If you don’t have the right machine, your coffee will come out weak and tasteless. With the right machine, each cup of coffee is like a taste of Heaven. Pod coffee makers are all the rage these days, thanks to the fact that they make the brewing process a cinch. Simply pop in a pod, press the “Brew” button, and let the machine do its work. No muss, no fuss. Winner: Both, depending on your kitchen setup. The Nescafe Dolce Gusto set the standard for pod coffee makers, and it is still considered one of the best on the market. It’s a beautiful-looking, compact appliance that fits on any kitchen counter, and adds to your kitchen décor with its modern design. You’ll find that the machine uses ONLY Dolce Gusto pods, which will run you roughly $10 for a box that produces 16 cups of coffee. You’ll find that Nescafe has a much broader range of drinks than most competing brands–everything from American coffee to espresso to cappuccino to iced coffee to iced tea to hot chocolate. 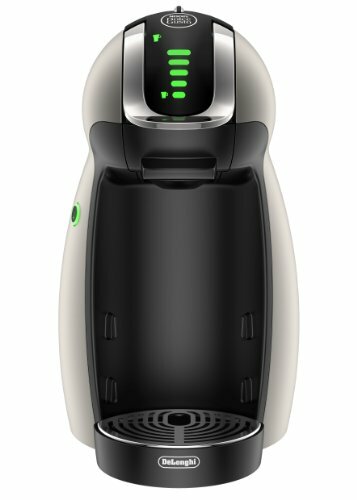 As long as you’re willing to shell out for the pods, the Dolce Gusto will be a great way to make coffee! This is the perfect option for those who prefer fancy coffee drinks, but it falls a bit flat when it comes to brewing a simple cup of coffee. It’s no match for a proper espresso maker or cappuccino maker. However, for those who love flavored coffee and tea drinks, it’s a good choice. The Tassimo T20 is a compact pod coffee maker designed to be quick and easy to use. The espresso machine churns out a delicious cup of coffee, but just one per pod. It works exclusively with Tassimo T-Discs, which will run you between $8 and $10 for one pack of pods–or 16 cups of coffee. With the automatic cleaning and de-scaling function, you’ll find that it’s a perfect machine for people who hate a messy kitchen. It will fit in just about any kitchen cabinet or under the counter, and its sleek, modern design makes it a beautiful appliance that will enhance your kitchen décor. Definitely one of the best-looking coffee makers around! The adjustable cup stand makes it easy to brew your coffee into just about any mug of any size. Thanks to the barcode reader built into the coffee machine, you can turn any of the dozens of Tassimo T-Discs into a perfect cup of coffee! Size — How large is the coffee maker? For smaller kitchens, size constraints are a very real problem. The Dolce Gusto is the shorter of the two coffee makers, but the Tassimo T20 takes up less counter space. 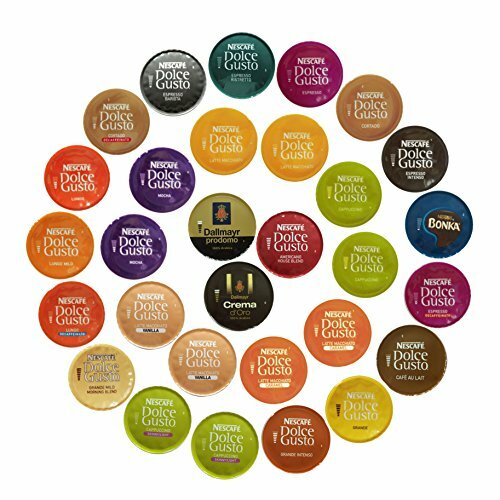 Beverage Selection — How many different types of coffees, teas, and chocolates does each pod maker offer? For those who like fancy coffees, this is a VERY important element to consider. When it comes to variety, no one beats Nescafe. The Dolce Gusto has upwards of 30 beverage options, while the Tassimo has closer to 15. You have many more choices of hot and cold drinks with the Nescafe Dolce Gusto. Starbucks USED to make T Discs, but no longer. Quality of Coffee — If you’re a simple coffee person, the selection of beverages doesn’t matter anywhere near as much as the quality of the coffee the machine churns out. Let’s be very clear: pod coffee makers cannot compare with the quality of coffee produced by an espresso or cappuccino maker. Of the two, the quality and flavor of the Tassimo coffees is slightly better than the Dolce Gusto coffees. Nescafe may have mastered instant coffee, but it hasn’t quite gotten the flavor and richness quite right. Durability — You can’t just buy a coffee maker for now, but you have to find an appliance that you know will last for years to come. Pod coffee makers have a tendency to break down after a few years–something to be aware of while shopping. Both machines have similar lifespans–between 1 and 3 years. 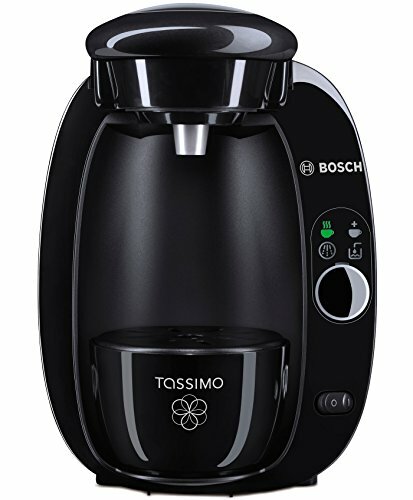 One user reported that they have had the Tassimo T20 for up to 10 years, but that is definitely the exception to the norm. However, the fact that the coffee pod maker can last for so many years gives Tassimo the edge in terms of durability. Speed –– How fast does the machine brew your cup of coffee? Do you spend 5 minutes waiting, or does it churn out a fresh cup in less than 2 minutes? The Dolce Gusto brews its coffees and teas in under 1 minute, but the Tassimo T20 takes closer to 3 or 4 minutes. Operation — How easy is the machine to set up and start using? How hard is it to produce a cup of coffee? Is it really as simple as adding water, popping in a pod, and pressing a button? Both of the machines are designed to be as user-friendly as possible, with a plug-and-play operation. The process of brewing coffee is a simple multi-step process, though Nescafe has a more user-friendly operation. Cleaning — This is one of the most important features for a coffee pod maker. With regular coffee makers, you can simply do a “water run” (using only water, without adding coffee beans) to flush out the machine. This isn’t possible with pod makers, meaning the machines have to have a self-cleaning option. The Dolce Gusto’s self-cleaning option is quick and easy. Simply press the button, and the machine will flush itself out. With the Tassimo T20, however, you have to use a “cleaning disc”–a separate coffee pod. While the Tassimo T20 does have a lot to offer, it can’t quite match the Nescafe Dolce Gusto. You may spend a bit more on the Nescafe coffee maker, but in the long run, it will be worth it! Previous Post: « The Best Budget Espresso Machines – Espresso for the Rest of Us!